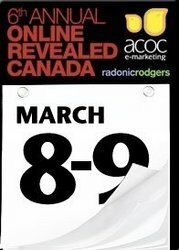 A Couple of Chicks e-Marketing Co-founders Patricia Brusha and Alicia Whalen with presenting partners RadonicRodgersDesign+Marketing have announced the 6th annual online marketing conference Online Revealed will be held March 7-9, 2011 at the Sheraton Centre in Toronto. Known as the only user generated conference, the 2011 program offers cutting edge content, superior speakers and is the only Canadian conference to offer hands on learning workshops. In addition to an inspiring keynote, panel sessions and case studies based on real life experiences, this year the online marketing conference will be offering 31 unique workshops available for all learning levels with three tracks to choose from. An alumni track is available with advanced learning opportunities for those who have attended the ORC tourism marketing conference in the past or have had an Internet Marketing position for over 2 years. Unique to the travel marketing conference are Learning Labs with hands on instruction on building a blog, Facebook Page or setting up a Google Adwords account. Destined to be incredibly popular, space is limited for the learning labs and pre-work is required. The back by popular demand track covers the hot topics for online marketing with updated content from new and returning workshop leaders. Industry leaders from Google, Tripadvisor, WestJet, Fairmont Hotels and Resorts, Travelzoo and more will present workshops over two days at Online Revealed specific to marketing tourism online. Workshop topics Include iPhone, iPad, iMarketing, Enterprise Level SEO, Reputation Management: How to Manage Brand & Trademark Issues, Social Media Monitoring and a Word Press Camp on Blog Building. We are very proud for Online Revealed 2011 to have joined with the Hotel Association of Canada Conference to bring attendees a brand new conference, The Canadian Tourism Marketing Summit, states Patricia Brusha, Co-Founder of A Couple of Chicks e-Marketing and Online Revealed. The Summit will focus on a wide spectrum of marketing topics suitable anyone involved in Canadian tourism. All Online Revealed Canada delegates will have the added content of the Summit to enhance their conference experience. And, with the new format, Online Revealed Canada delegates are able to attend all 3 conferences for one low price. This is a powerhouse week of learning never before offered for online marketers in Canada we are thrilled, notes Brusha. In addition, this will be the first year that the Canadian e-Tourism Awards will be incorporated as an ongoing part of the of the online marketing conference program. Online Revealed is ideal for e-Commerce Managers, Brand Managers, Sales Directors, Marketing Managers, GM’s, CEO’s and Revenue Managers from all areas of the travel, tourism and technology industry. Join the over 1,200 tourism marketing professionals who have benefitted from attending Online Revealed in the past presented by online marketing experts A Couple of Chicks e-Marketing and RadonicRodgersDesign+Marketing. The online tourism marketing conference Online Revealed Canada was organized and produced as a grassroots effort six years ago to recognize Canada as special and unique when it comes to online travel distribution by Patricia Brusha and Alicia Whalen, Co-founders of A Couple of Chicks e-Marketing. Online Revealed Canada brings together travel professionals, individual hotels, hotel brands, marketing agencies, destination marketing organizations, vendors, suppliers and tourism operators to stake claim in the multi-billion-dollar ever changing online travel market. Since its inception in 2006, over 1,200 travel industry professionals have benefitted from the over 90 workshops and presentations produced by Online Revealed. The 6th annual tourism marketing conference will be held March 7-9, 2011 at the Sheraton Centre in Toronto. This entry was posted in Which Open Source Blog and tagged 2011, Anniversary, Celebrates, Conference., March, Marketing, Online, Revealed, Toronto on January 19, 2013 by Administrator. Artisan Business Group, Inc., announces the Invest in America 2013 (Shanghai) Summit & Exhibition which is to take place at Shanghai Exhibition March 15-18, 2013 in Shanghai China. The event is expanded into a 4 full day conference and exhibition (including the Chinese Emigration Industry Roundtable), in conjunction with the largest Shanghai Spring Real Estate Fair which expects over 120,000 audiences. The Invest in America 2013 (Shanghai) Summit & Exhibition – Immigration and Investment Opportunities is the 3rd annual USA-themed investment conference and exhibition in China. With instant access to major Chinese media and nationwide business network, the event will attract large crowds of interested investors and business executives who are eager to learn more about your investment and business opportunities. This event is to be conducted differently than previous events in Guangzhou and Shanghai. The 2013 Summit will be extended to a 4 day event and to be held along with “Shanghai Property Trade Show” under a single roof in Shanghai Exhibition Center, the Shanghai Property Trade Show has been running for 15 years, boasting a vast exhibition space and a large number of visitors, the average audiences for Shanghai Property Trade Show is over 120,000 people. This is the most well known show brand between the property trade shows in Shanghai. The Summit will benefit from a large audiences flowing from the Shanghai Property Trade Show. The Summit with 60 exhibition booths and 20 breakout sessions welcomes U.S. EB-5 regional centers, investment project developers, real estate brokerage firms, franchises, PE and VC companies, financial services, attorneys, CPAs, international trade agencies, government officials, and colleges to participate in exhibitions and presentations. The registration is now open to exhibitors. Please visit official event website at http://www.InvestAmerica2013.org for exhibitor information. This entry was posted in Which Open Source Blog and tagged 1518, 2013, America, Exhibition, Host, Invest, March, Shanghai, Summit on January 9, 2013 by Administrator. Web developer Insecure.org is pleased to announce the upcoming sale of its prized domain name Social.org at a no-reserve auction hosted by NameJet.com from March 20 until March 23. Interest is high in this name after the reported $ 2.6 million sale of the similar name Social.com to Salesforce last year. Social.com was the highest reported domain name sale of 2011, according to the Domain Name Journal. Social.org is particularly valuable given the growing success of social networking companies, including the planned $ 100 billion Facebook IPO. Insecure.org CTO Gordon Lyon, states that “Social.Org is an extremely powerful name, combining the enormously popular ‘social’ keyword with the ‘Org’ extension that is commonly used by community/social sites like Wikipedia.org, Craigslist.org, WordPress.org, and Google’s OpenSocial.org. Companies that might be interested include social networking players like Facebook, Twitter, Google, Zynga, or LinkedIn; community/deal sites such as LivingSocial; dating sites; social media sites; or even a new, disruptive startup!” More than 360 potential buyers have already submitted pre-bids. Verification can take up to 48-hours, so bidders should sign up early for what is sure to be one of the top domain name sales of 2012! For further information, see http://social.org. This entry was posted in Which Open Source Blog and tagged Auction, Domain, March, Name, Social.org, Sold on December 20, 2012 by Administrator. This entry was posted in Which Open Source Blog and tagged Auction, Domain, March, Name, Social.org, Sold on December 19, 2012 by Administrator. This entry was posted in Which Open Source Blog and tagged Auction, Domain, March, Name, Social.org, Sold on December 18, 2012 by Administrator. This entry was posted in Which Open Source Blog and tagged Auction, Domain, March, Name, Social.org, Sold on December 17, 2012 by Administrator.